Tagged Cobia VIMS researcher Mike Oesterling holds a tagged cobia. Photo by Margaret Pizer/VASG. Cobia Release VIMS researchers Dan Sennett and Mike Oesterling release hatchery-reared cobia into the York River. Photo by David Malmquist. 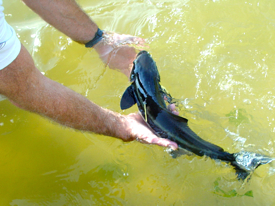 The cobia tag-and-release study was part of an initiative—funded by NOAA and Sea Grant—to proactively evaluate species’ potential for stock enhancement, a strategy for boosting wild populations by releasing hatchery-reared fish. Cobia proved a good candidate for stock-enhancement research. Not only is cobia popular among anglers, but researchers already knew how to successfully spawn cobia in a lab from earlier aquaculture research. As for the cobia that made it all possible, it won’t get caught again. Now of legal size, it was not released but enjoyed by hungry anglers that evening.